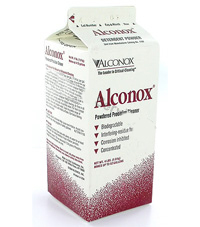 Home / Field Supplies / Cleaning Products / ALCONIX Powder, 4 lb. Used to clean: Healthcare instruments, laboratory ware, vacuum equipment, tissue culture ware, personal protective equipment, sampling apparatus, catheters, tubing, pipes, radioactive contaminated articles, optical parts, electronic components, pharmaceutical apparatus, cosmetics manufacturing equipment, metal castings, forgings and stamping, industrial parts, tanks and reactors. Authorized by USDA for use in federally inspected meat and poultry plants. Passes inhibitory residue test for water analysis. FDA certiﬁed. 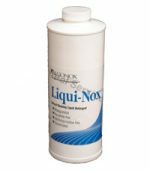 Used to remove: Soil, grit, grime, bufﬁng compound, slime, grease, oils, blood, tissue, salts, deposits, particulates, solvents, chemicals, radioisotopes, radioactive contamination, silicon oils, mold release agents. Cleaning method: Soak, brush, sponge, cloth, ultrasonic, ﬂ ow through clean-in-place. Will foam—not for spray or machine use. Directions: Make a fresh 1% solution (2 1/2 tbsp per gal, 1 1/4 oz per gal, or 10 g per L) in cold, warm, or hot water. If available, use warm water. Use cold water for blood stains. For difﬁ cult soils, raise water temperature and use more detergent. Clean by soak, circulate, wipe, or ultrasonic method. Not for spray machines: will foam.